"'Easy as pie' is just the case with this pie." 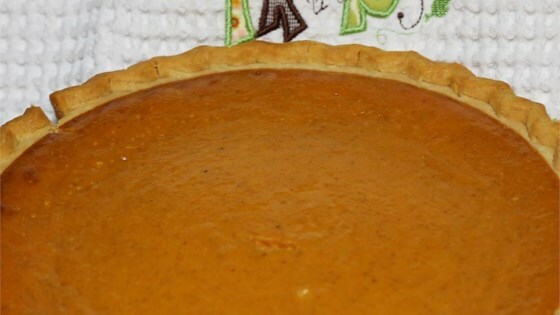 Fit pie crust into a 9-inch pie dish; pour pumpkin mixture into the crust. Place pie on a baking sheet and bake in the preheated oven for 15 minutes. Reduce heat to 350 degrees F (175 degrees C) and bake until filling is set, 35 to 40 minutes. I thought it was way too sweet with the whole can of sweetened condensed milk. I made this as a crustless pumpkin pie....just put the filling in a casserole dish and baked it. Topped it with whipped cream while still warm....quick, easy and tasty! SUPER EASY!!! Try with vanilla and cinnamon to taste if you don't have pumpkin pie spice. "Or don't want to spend the $4 it cost"
So easy. My husband loves pumpkin pie. I like to bake, especially during the holidays. Thanks for posting this receipe....so easy and so delicious. So simple to make, and bonus points go to this recipe because I had everything in my pantry to make it.